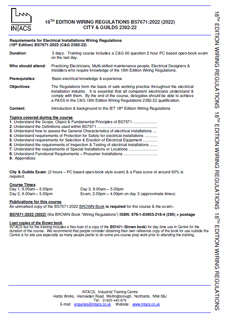 Do I need to do the C&G 2382-18, 18th Edition Wiring Regulations course & exam? Although it is not a legal requirement to have the C&G or EAL 18th Edition Wiring Regulations qualification, it is essential that people working on domestic, commercial or industrial installations are up to date with the current Wiring & Installation Standards & that they (or the Company) have the evidence to support this. People who are working on or around new or existing installations need to understand what is & what is not acceptable, what is considered safe, what is considered dangerous & to be able to do the necessary calculations to determine cable sizes, loads & the capacity of various electrical components. Systems & installations that your people may be working on (even if they are old installations) in terms of Electrical Safety & Compliance become the responsibility of the last person (or company) to have worked on them. For this reason alone, your Company has to ensure that work is done properly & to the current standards. Some companies tell us that they do not require their Electrical or Multiskilled maintenance personnel to undertake “Installation” work. They say that any Installation work will be done by external contractors. Where this is the case, we do offer alternative options which do satisfy the legal requirement for companies to make sure their people have had training appropriate for their job role, especially where the requirement for Safe Working. We know that in the industrial environment, the 18th Edition Wiring Regulations only apply up to a certain point. Inside control panels there is a different set of Regulations. However, the other Regulations are still based on the 18th Edition & it would be difficult to argue that knowledge of the Current Wiring Regulations was not important for both Electrical & Multiskilled maintenance personnel in industry. Don’t forget, the Wiring Regulations is a bit like the Highway Code. Knowing the Highway Code does not make a good (or safe) driver. The 18th Edition Wiring Regulations is pure theory. The 18th Edition Wiring Regulations does not contain any practical; it is not a measure or indication of Safe Working, it is however guidance on how to build & maintain safe electrical systems. If companies want to satisfy the demands of the HSE, they have a legal responsibility to provide appropriate Electrical Safety training. Additionally, those companies need to operate a Safety Culture on-site & people need to be practically assessed in order to demonstrate that they know how to Work Safely. The starting point should be that companies have their own appointed Electrical Duty Holder. We have a 1 day Electrical Duty Holder course. The Electrical Duty Holder is the person who “carries the can” for Electrical Policy & Safe Systems of Work on-site. We also have a 1 day Electrical H&S, Safe Electrical Isolation, Resetting Trips & Overloads course for shop-floor maintenance personnel, production people & line operators. Clients tell us that they have been recommended by the HSE to contact us regarding their Electrical Safety training requirements as we not only provide thorough training but we also provide Competency Logs for both Safe Electrical Isolation & another for Resetting Trips & Overloads. The First-stage Competency Checks are completed during the course but importantly the Competency Logs allow for further reinforcement back on-site & for review & re-check on a future date as required. Click to learn more about our Electrical Duty Holder course or Electrical H&S, Safe Electrical Isolation, Resetting Trips & Overloads courses. What are the main changes to BS 7671? 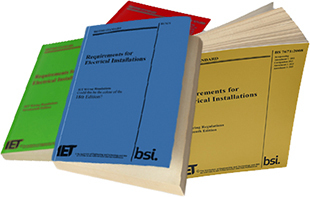 Below is an official list from IET of the main changes to BS 7671. It must be noted that there are further changes throughout the publication in addition to those below. · Metallic pipes entering the building having an insulating section at their point of entry need not be connected to the protective equipotential bonding (Regulation 411.3.1.2). · The maximum disconnection times stated in Table 41.1 now apply for final circuits up to 63 A with one or more socket-outlets and 32 A for final circuits supplying only fixed connected current-using equipment (Regulation 411.3.2.2). · Regulation 411.3.3 has been revised and now applies to socket-outlets with a rated current not exceeding 32A. There is an exception to omit RCD protection where, other than a dwelling, a documented risk assessment determines that RCD protection is not necessary. · A new Regulation 411.3.4 requires that, within domestic (household) premises, additional protection by an RCD with a rated residual operating current not exceeding 30 mA shall be provided for AC final circuits supplying luminaires. · Regulation 411.4.3 has been modified to include that no switching or isolating device shall be inserted in a PEN conductor. · Regulations 411.4.4 and 411.4.5 have been redrafted. · The regulations concerning IT systems (411.6) have been reorganized. Regulations 411.6.3.1 and 411.6.3.2 have been deleted and 411.6.4 redrafted and a new Regulation 411.6.5 inserted. · A new Regulation group (419) has been inserted where automatic disconnection according to Regulation 411.3.2 is not feasible, such as electronic equipment with limited short-circuit current. · A new Regulation 421.1.7 has been introduced recommending the installation of arc fault detection devices (AFDDs) to mitigate the risk of fire in AC final circuits of a fixed installation due to the effects of arc fault currents. · Regulation 422.2.1 has been redrafted. References to conditions BD2, BD3 and BD4 have been deleted. A note has been added stating that cables need to satisfy the requirements of the CPR in respect of their reaction to fire and making reference to Appendix 2, item 17. Requirements have also been included for cables that are supplying safety circuits. For all other cases, a risk assessment has to be performed in order to determine if protection against transient overvoltage is required. There is an exception not to provide protection for single dwelling units in certain situations. · Regulation 521.11.201, which gives requirements for the methods of support of wiring systems in escape routes, has been replaced by a new Regulation 521.10.202. This is a significant change. · Regulation 521.10.202 requires cables to be adequately supported against their premature collapse in the event of a fire. This applies throughout the installation and not just in escape routes. · Regulation 522.8.10 concerning buried cables has been modified to include an exception for SELV cables. · Regulation 527.1.3 has also been modified, and a note added stating that cables also need to satisfy the requirements of the CPR in respect of their reaction to fire. · Two new regulations (542.2.3 and 542.2.8) have been introduced concerning earth electrodes. · Two further new regulations (543.3.3.101 and 543.3.3.102) have been introduced. These give requirements for the insertion of a switching device in a protective conductor, the latter regulation relating to situations where an installation is supplied from more than one source of energy. · Regulation 550.1 introduces a new scope. · New Regulation 559.10 refers to ground-recessed luminaires, the selection and erection of which shall take account of the guidance given in Table A.1 of BS EN 60598-2-13. · Part 6 has been completely restructured, including the regulation numbering to align with the CENELEC standard. · Chapters 61, 62 and 63 have been deleted and the content of these chapters now forms two new Chapters 64 and 65. · A new Regulation 710.421.1.201 which states for all final circuits supplied by medical IT systems in medical locations of group 2, AFDD shall not be used. This section contains a number of changes including requirements for electrical separation, RCDs, proximity to non-electrical services and protective bonding conductors. · This section contains significant changes to Regulation 722.411.4.1 concerning the use of a PME supply. · The exception concerning reasonably practicable has been deleted. · Changes have also been made to requirements for external influences, RCDs, socket-outlets and connectors. This is an entirely new section and applies to onshore installations dedicated to the supply of inland navigation vessels for commercial and administrative purposes, berthed in ports and berths. Most, if not all, of the measures used to reduce the risks in marinas apply equally to electrical shore connections for inland navigation vessels. One of the major differences between supplies to vessels in a typical marina and electrical shore connections for inland navigation vessels is the size of the supply needed. · The scope of Section 753 has been extended to apply to embedded electric heating systems for surface heating. · The requirements also apply to electric heating systems for de-icing or frost prevention or similar applications, and cover both indoor and outdoor systems. · Heating systems for industrial and commercial applications complying with IEC 60519, IEC 62395 and IEC 60079 are not covered. Appendix 1 British Standards to which reference is made in the Regulations. Includes minor changes and additions. This is a new appendix that provides recommendations for the design and erection of electrical installations, including installations having local production and storage of energy for optimizing the overall efficient use of electricity.